Soline and Erica Shaffer at Highland Gardens in PA. The garden center manager held the garden center owner’s face in her hands. A perfect fit for a garden center owner, the woman’s name is Soline. “Soline, does that mean sunshine?” Both women laughed. “Well, Soline means sunshine to me,” said the garden center manager. No, they weren’t celebrating a particularly good sales day. They were celebrating a connection formed between two very similar and very different women. 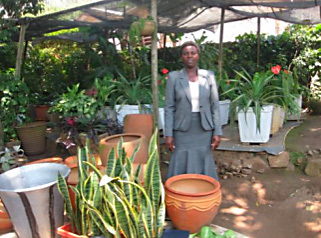 Soline owns a landscaping business and garden center named Saintpaulia Flower Center in Rwanda. She employs 14 people and the President of Rwanda is one of her clients. Erica Shaffer, is the Nursery Manager for Camp Hill, PA’s Highland Gardens, Certified Pennsylvania Horticulturalist and Landscape Designer. 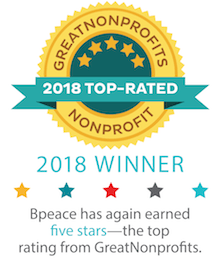 The two women found themselves on the same continent thanks to Bpeace – the non-profit network of business professionals who work to advance women in conflict-affected countries including Afghanistan, Rwanda and El Salvador. Bpeace works with business owners and entrepreneurs to bolster their success, promote stability and enhance their hiring ability. Bpeace believes creating jobs, creates peace. Their volunteers and ground staff focus on entrepreneurship, economic and workforce development in countries emerging from war in order to sustain the peace or create an environment for peace to take hold. One opportunity created by Bpeace is travel to the US. In April 2011, five Rwandan businesswomen traveled to the Harrisburg area to learn from host businesses here. Among them was a hotel owner, members of a special events planning firm, the only female funeral director in Rwanda and, of course, Soline. This group of dynamic women employs 73 Rwandans who in turn support 438 family members. All of these highly successful women endured war and genocide in their country. The Rwandan genocide saw nearly 1 million people killed in 90 days. Many of these women lost family members. Soline lost 14 close family members during the genocide. Soline’s determined and warm spirit shown brightly true to her name during her visit to Harrisburg. While at Highland Gardens, she learned many things. Importantly, she and Erica got to know each other on a personal level, laughing and telling stories. Gardeners here struggle with groundhogs and squirrels. In Rwanda, the problem is monkeys. A monkey can make a mess of a garden. (I can imagine that!) Erica shared some squirrel proofing techniques and the idea of "have a heart" traps. But it seems monkeys might be even more mischievous than your average groundhog. 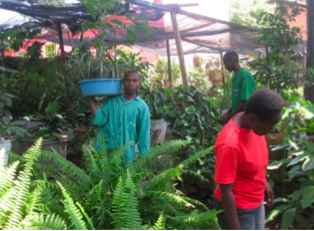 The use of potting soil isn’t prevalent in Rwanda. Erica explained the keys to good growing medium. Soline found it fascinating that we feed birds here. Erica helped her with pricing and marketing strategies. For Erica, seeing the Soline’s excitement transported her outside of the day to day craziness of horticulture in the spring. “I learned from her to remember how delightful this business is. It is one cool quirky industry to be in!” she said. Soline was also able to spend time with landscaper David Schultz and local nursery grower Dillers. Each Rwandan woman visiting through Bpeace was paired with a local business, including the Harrisburg Hilton and Towers, during their week in PA. The women will continue to have support from their U.S. hosts. Erica and Soline are emailing each other. Consalata, a marketing manager for a hotel in Rwanda thanked all the hosts and volunteers during a goodbye gathering. “It seems we conduct business in Rwanda like you did 100 years ago. But we are not disheartened. We will catch up with the U.S. in 10 years,” said Consalata. And you know, with that kind of spirit, I think they will.